Two UK men held on Afghanistan-related terror charges have lost their legal fight to avoid extradition to the US. Babar Ahmad, 32, from Tooting, south-west London is accused of running websites inciting murder, urging holy war and raising money for the Taleban. 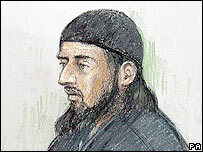 Haroon Aswat, from Yorkshire, is accused of plotting to set up a terror camp to train fighters for Afghanistan. The men said they risked mistreatment by the US, but High Court judges said these claims were not proven. Lord Justice Laws, sitting in London with Mr Justice Walker, said the men's legal team had not proved to a required standard their allegations that the US might violate undertakings given to the UK that the men would be fairly treated. He said the court was "acting on the faith that the United States will be true to the spirit and the letter" of diplomatic exchanges with the UK government and obligations under the 1972 UK - USA Extradition Treaty. Lawyers for the two men say they hope to appeal to the House of Lords to argue over two points of law surrounding the extradition decision. They argued against the use of diplomatic letters as a basis for guaranteeing human rights, and to raise concern over US military detention and "rendition" of suspects to third countries for questioning. "This is extreme public importance, not just in this country," said human rights solicitor Gareth Peirce. The judges said they would take time to consider whether both men should be allowed to take their case to the House of Lords. Edward Fitzgerald, QC, representing both men, earlier asked the judges to stop the extradition process. He said there was a danger the suspects' human rights would be abused, despite the assurances from US authorities. Mr Fitzgerald said the two were in danger of being kept indefinitely at Guantanamo Bay, taken to a third country for questioning, or tried and sentenced by a military tribunal as enemy combatants. However, lawyers for the US said the assertions made by Mr Fitzgerald were "speculative". They said the assurances they had been given, that the men would be fairly treated, were "an intrinsic, accepted and flexible tool in the extradition process". Mr Aswat, of Dewsbury, West Yorkshire, was arrested in Zambia and deported to the UK in August 2005. He has been indicted by a federal grand jury in New York City, accused of conspiring with radical cleric Abu Hamza al-Masri to set up a "jihad training camp" in Oregon in the United States. Mr Ahmad, 32, is a computer expert from Tooting, South London. He was arrested under anti-terror laws in August 2004 and charged with terror crimes by a US court two months later. After the extradition appeal hearing, his father Ashfaq Ahmed, said: "We are very disappointed at the High Court decision. "We are hopeful that the High Court will certify that there is a point of law of public importance on military detention and rendition, and allow this matter to go to the House of Lords."